In our original report on Insulet Corporation (NASDAQ:PODD) we identified 44 undisclosed Omnipod patient deaths and 51 excerpts from FDA complaints by parents and others that claim the Omnipod puts children at risk of harm and even death. We also outlined the various product defects with the Omnipod that are currently under FDA investigation. Still, to this day, PODD is valued at $2+ billion while its closest competitor, Tandem Diabetes Care, Inc. (NASDAQ:TNDM), which has 46,000 patients - about ½ of PODD's patient base, is valued at less than $100 million. Given this valuation disparity one would think TNDM's product cannot compete with the Omnipod yet TNDM's insulin pump has been the #1 rated insulin pump for the last 3 years. We think it is fair to say both companies are inappropriately valued at this time. We reiterate our rating of PODD shares as a strong sell and point to additional new information that we have uncovered or was provided to us by others since our initial report. 1. Medtronic Plc's (NYSE:MDT) 670G is a legitimate threat near-term and long-term threat to all insulin pump manufacturers. PODD is alone in refusing to acknowledge this threat. 2. PODD's history of misleading investors can not be questioned. Prior management deceived investors on a grand scale as we outlined in our original report. PODD's current CEO is continuing the effort. We provide evidence of his deception of investors and sell-side analysts within this report along with allegations by yet another whistleblower associated with PODD that appears to have been paid off. The allegations center around the CEO's repeated directives to PODD employees to commit illegal acts including bribing physicians - even after the CEO was informed of the illegality of these actions on multiple occasions. 3. PODD was the only participant in the insulin pump market segment that recovered sharply from recent commentary by DXCM, TNDM and MDT that the 670G, which won't launch until the spring of 2017, was already impacting sales. Patients are delaying their purchase of an insulin pump until the 670G becomes available. 4. PODD's arguments appear to be centered on saving its stock rather than the distressing reality of the competitive landscape. We outline in this report why PODD's commentary appears flawed and how it could rise to the level of "outright intentional lies." 5. We don't question statements by every public company executive but we do question statements by executives who (1) have been caught misleading investors previously (2) have been accused of directing employees to commit illegal acts (3) make remarks that contrast with numerous other participants in their market segment and lastly (4) have a lot to lose should the stock price go down. In the first few days of November 2016, the share price of DXCM, TNDM and PODD all collapsed, as seen in the charts below. PODD's shares recovered quickly as a result of PODD's comments during the Q3 2016 earnings call on November 3, 2016. We note that PODD's market commentary contrasted sharply with previous comments made by the management of DXCM, TNDM and MDT, respectively. During DXCM's Q3 2016 earnings call, management acknowledged the disruptive impact new innovative products, specifically MDT's 670G, was having on DXCM. DXCM shares dropped 20%. DXCM acknowledged that patients are waiting for the availability of several new innovative insulin pumps in 2017 before committing to purchasing one. This is having the effect of slowing current sales and creating near-term top and bottom-line uncertainty. "Many patients are willing to delay purchase decision until this system becomes commercially available, or they're being directed to purchase the current Medtronic offering, with the promise of being first in line for the 670G." As of August 2015, it appears about 25% of Omnipod patients also used DXCM's continuous glucose monitoring product ("CGM"). Omnipod is used by 100,000 patients. We therefore estimate that DXCM has 25,000 patients that use the Omnipod. According to an SEC filing on January 12, 2016, DXCM's patient base totaled between 140,000 and 150,000 as of that date. Fast forward to today, some 9 months later from the DXCM figures and 14 months since the PODD figures and we believe DXCM's CEO should have some visibility on PODD's competitive position given that Omnipod users appear to make up approximately 17% (i.e. 25,000/150,000) of DXCM's overall business. We do note that these figures could be off slightly due to growth or drop in either of these figures since each were reported but we suspect that change is immaterial to this analysis as Omnipod users are a clear significant portion of DXCM's patient base. Our point here is that DXCM's CEO spoke quite aggressively during DXCM's Q3 2016 earnings call in stating that the 670G was being given "significant press surrounding this product, which has created a considerable - which has created considerable confusion in the marketplace." He did not suggest that the Omnipod, or any specific product or segment of the market, was proving to be immune from the impact of patients waiting to try new innovative products. As a result, it seems quite odd to us that DXCM is seeing such a strong impact on its sales but PODD is not. TNDM reported Q3 2016 earnings on November 1, 2016. Earnings were short of estimates and there was a 59% drop in TNDM's share price. In our view this price collapse is not explained by the earnings miss alone. We believe the collapse in the share price was primarily as a result of management's commentary during their earnings call about challenging market dynamics and uncertainty caused by the approval and pending market launches of new innovative insulin pump devices. "We have experienced a significant reduction in our sales and sales pipeline thus far in Q4. We do believe there is some pausing in the customer pump evaluation process as people are waiting for…consideration of newly launched competitive products and the regulatory approval of others." PODD considers TNDM to be one of its primary competitors. As a result, it seems odd to us that TNDM's market commentary contrasts so sharply with PODD's commentary. Medtronic's artificial pancreas ("670G") was recently approved by the FDA. The 670G is a widely anticipated first product of its type that will automate the management and delivery of insulin for diabetics (except after meals). This is one of many next-gen products we identified in our initial report that is expected to be available soon. MDT's CEO provided additional confirmation that patients are pausing and waiting for new innovative products to become available before they make a commitment to purchase a new insulin pump. "We expect the majority of customers to wait to purchase the 670G once it launches in the spring of 2017…this dynamic is driving lower than expected pump and consumable sales"
This is the market leader speaking. In summary, 2 of PODD's primary competitors and a key supplier whom PODD shares 25% of its patient base with all are confirming the "patient purchasing pause" that is currently impacting seemingly all players within the insulin pump sector. On November 2, 2016, PODD shares dropped 11% on the negative commentary by DXCM and TNDM the night before. Then, on its November 3, 2016 earnings call, PODD management provided a sharp contrast to market commentary provided DXCM and TNDM. Management's overwhelmingly positive comments led to a sharp recovery in PODD's share price on November 4, 2016. Below we review specific quotes by PODD management to consider whether they were truthful or not. Our comments are provided thereafter. "Our messaging is focused on the multiple daily injection patients. That is not where 670G is focused." "670G performs largely as advertised and "good enough" sensor accuracy allows the product to capture some MDI patients…"
Ms. Petrovic claimed that the 670G was not competitive because the 670G WAS NOT targeting the largest portion of the Type 1 diabetes market, the MDI patients, which make up 70% of the market. On even a high level this statement appears implausible. We dug deeper however by reviewing several sell-side analyst reports to determine the truth. We continue to believe this statement is baseless. We have also contacted MDT to confirm our view and are awaiting a response from MDT. "Omnipod's target market and value proposition are unique." Our response: This is an exaggeration by any measure. It is true that the 670G is not approved for patients 14 years and younger, i.e. children. In our initial report, we noted that PODD confirmed 30% of its patient base are children. So perhaps it is true that 30% of PODD's patient base is protected from MDT's 670G. It is also true that PODD's value proposition includes a tube-less design whereas the 670G does not. As far as we know these are the two most significant advantages PODD specifically has over the 670G. However, by management's own reasoning, the remaining 70% of PODD's current patient base could decide they want to try the 670G. Worse yet, the tubeless design is a great concept but the Omnipod's various unresolved product defects, among other issues, have held it back such that only 13% (according to a November 17, 2016 analyst note by Jefferies) of diabetics have chosen to use the Omnipod some 11 years after its initial introduction. We see 30% of PODD's patient base as being protected from the 670G but the remaining 70% of its patient base being at risk. We also consider that patients who have never used a pump could very likely choose the 670G over the Omnipod. If they did it should not be surprising as 87% of diabetics (i.e. 100%-13%) have chosen not to use the Omnipod for one reason or another. "The second sentiment expressed in a number of ways from these physicians was that people living with the burden of diabetes are not seeking more complex technology. What they really want is less work." Our response: This is an outrageous statement. The excitement over the 670G and even PODD's own Horizon device that PODD is trying to develop is premised on automating part or all of the insulin management and delivery process. Automation and reducing human interaction is the whole premise of the 670G. To argue that the Omnipod requires "less work" than the 670G is a baseless claim. We won't belabor the fact that the 670G had no adverse events during its recently concluded clinical trial while the Omnipod is synonymous with adverse events. Surely, adverse events create "more work." "Omnipod's differentiated technology along with our exciting product pipelines do just that, reduce burden and simplify life." Our response: What exciting pipeline? PODD's Horizon artificial pancreas next-gen product is 2+ years away while MDT's next-gen product, the 670G, was approved two months ago and launches this coming spring. The Omnipod Dash, which is expected to be launched late in 2017, has been criticized as a non-event in the marketplace. If you are a PODD shareholder that is not exciting. That is concerning and reason enough to sell your PODD shares. A variety of sell-side analysts notes in the past few weeks also suggest that the competitive threat from innovative new products in PODD's market segment will or could likely impact PODD in 2017 and 2018. We outlined their statements in a previous report. PODD management suggested during the recent investor day they would reach $1 billion in sales by 2021. It was explained that in order to do this PODD would have to generate growth at 20% for each of the next 5 years. We see this as being implausible for the following reasons. 1. The insulin pump market is in a period of hyper-innovation and PODD is a full 2 years behind the innovation timeline of the market leader, MDT. 2. PODD's current product suffers from at least two serious product defects - one of which continues to be subject to an ongoing FDA investigation. The other which could just as easily force another recall in the near term. Developing a new more advanced next-gen device when your current device has serious product defects is undeniably a difficult task. 3. PODD's own financial reports show revenues have been decelerating at a rapid pace in each of the last three quarters. We don't believe PODD has explained this deceleration to investors. We believe the truth is that PODD is subject to the same market conditions as DXCM, TNDM and MDT. Patients are delaying their purchase of insulin pumps until the new innovative pumps are available to choose from. This makes sense. PODD's commentary does not. 4. We provide details below that suggest there is something holding up PODD's attempts to acquire significant market share in this sector. We don't attempt here to identify the actual reasons why but after 11 years, when market share is still in the low teens, we believe it is safe to say the current version of the Omnipod is not capable of leading the insulin pump market. If PODD cannot compete with or take over the leadership position in the insulin pump sector we have serious doubts it can grow at 20% for the next five years. This leads us back to PODD's ability to successfully innovate - which is perhaps an even greater area of concern we have. We were recently alarmed when we looked at PODD's actual top line growth rates reported in the last 3 quarters. 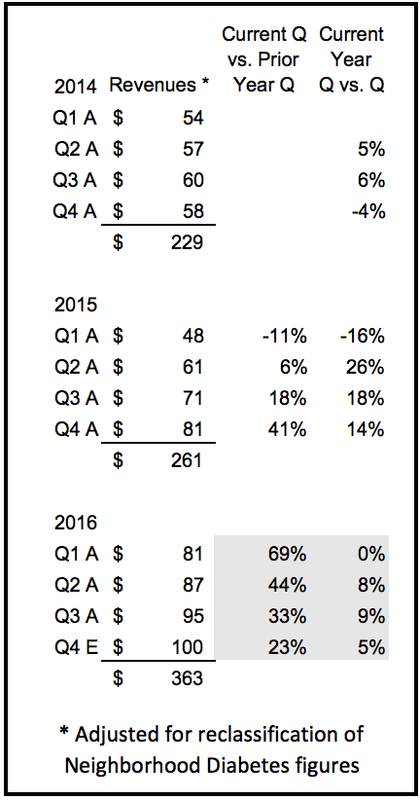 The decline from 69% growth in Q1 2016 to 23% forecasted growth in Q4 2016 should be alarming to investors and supports commentary by all of PODD's competitors and partners (i.e. DXCM) that diabetic patients are delaying their purchase of a new pump while awaiting new innovative pumps to become available. PODD has not provided any other reason for this drastic deceleration in growth. The Omnipod is now 11 years old. PODD management repeatedly reference how large the diabetes market is. We refer to this as the "Our TAM is huge" investor pitch that seemingly only desperate entrepreneurs or OTC executives are known to make. A key takeaway of the recent overly promotional recent investor day held by PODD was that revenues would be $1 billion in 2021. We view this as nothing more than a pie-in-the-sky desperate and promotional statement. Investors should care about PODD in 2017 and 2018. Those are going to be trying years and there is surely no guarantee PODD will survive the current competitive onslaught and remain a viable market participant in 2021. We note an article from February 2013 that stated PODD's market share at the time was 10% of the pump market. We also obtained a recent analyst note dated November 17, 2016 by Jefferies that stated PODD now has a 13% market share. We calculated PODD's market share CAGR form February 2013 until November 2016 (33 months, rounded up to 3 years) was actually quite anemic. In the same November 17, 2016 analyst note by Jefferies, the analyst stated "PODD puts the global insulin pump market as growing at +9-10% CAGR." PODD recently confirmed it will not have an artificial pancreas device on the market until late 2018 and likely not until 2019 - assuming they are successful developing their product. So if PODD believes it can grow at 20% for the next 5 years and the market is growing at a 9-10% CAGR and PODD's own market share growth in the past 3 years has been 9.14%, where is the remaining 11.86% growth coming from? We have yet to hear management provide a viable plan to achieve this growth other than to claim that new innovative product launches in the insulin pump market won't impact PODD. Of course we don't buy that argument for a second but the real question is not whether or not the new innovative devices will impact PODD but how PODD will take 11.86% of its growth from those new devices that are everyone byt PODD expects will be far more innovative and advanced than the Omnipod? Raul Oliva was a PODD employee in charge of marketing and business development. He was hired on March 15, 2013 and given the title "Director of Health Care Professional Marketing." 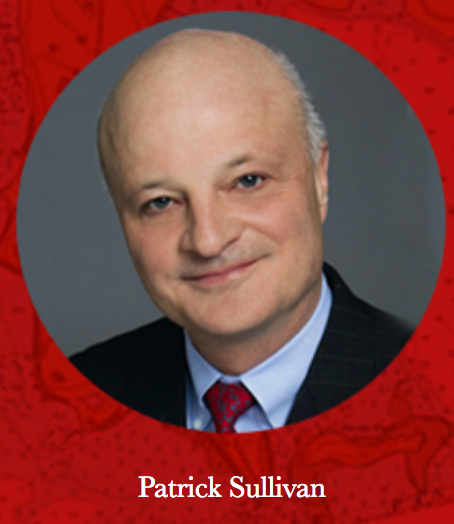 Patrick Sullivan was hired as PODD's Chief Executive Officer on September 16, 2014. 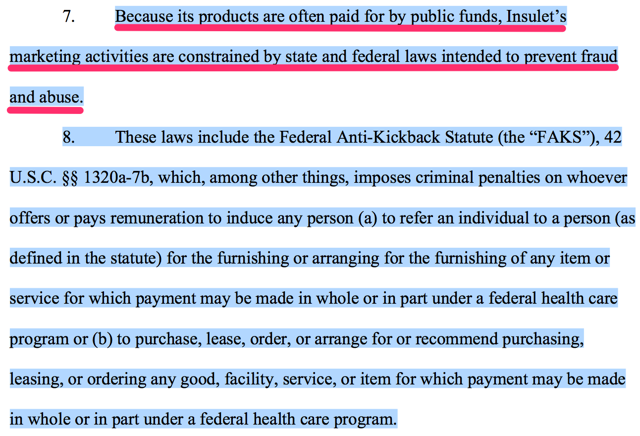 See Exhibit 4.
have been highlighted by us at our discretion to provide emphasis where needed. 1. 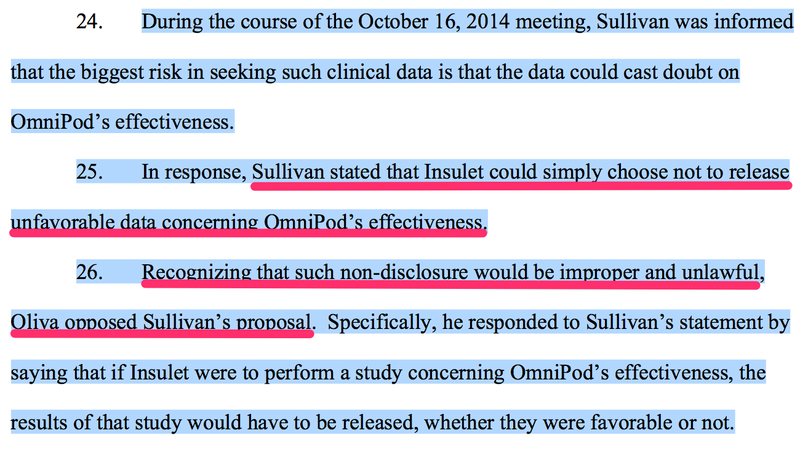 It is alleged that Sullivan suggested PODD circumvent the law, "if the data turns out bad for us - just bury it"
2. It is alleged Sullivan demanded PODD employees pay bribes to physicians "You gotta pay them. How else do you expect them to show up?" According to the Oliva Complaint, Mr. Oliva met with a member of PODD's compliance team on November 14, 2014 to voice his objections to Sullivan's repeated instructions to conduct unlawful acts. 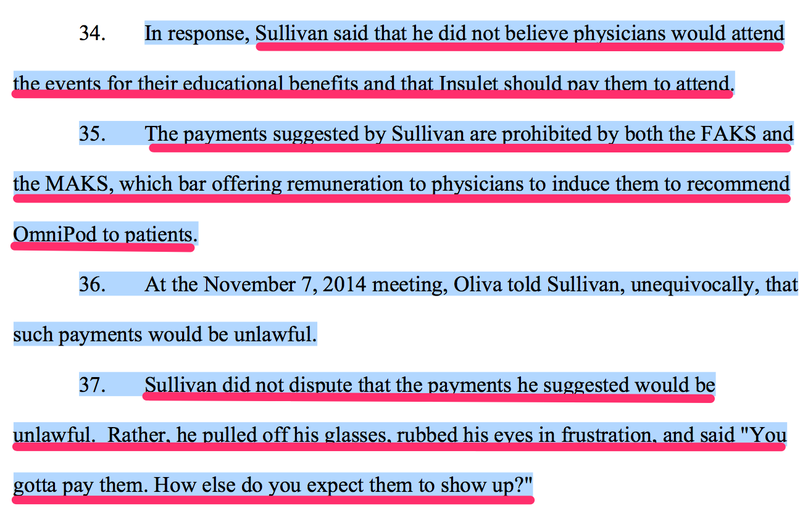 Mr. Sullivan was informed of Mr. Oliva's objections on or about November 20, 2014. It is unclear if PODD ever identified Mr. Oliva as a whistleblower. However, his actions appear to clearly represent those of a whistleblower. Just a few months later, on January 29, 2015, Mr. Oliva was terminated. See Exhibit 5. The Oliva Complaint alleged that PODD failed to disclose material information about safety or effectiveness of its sole product, the Omnipod. See Exhibit 5. 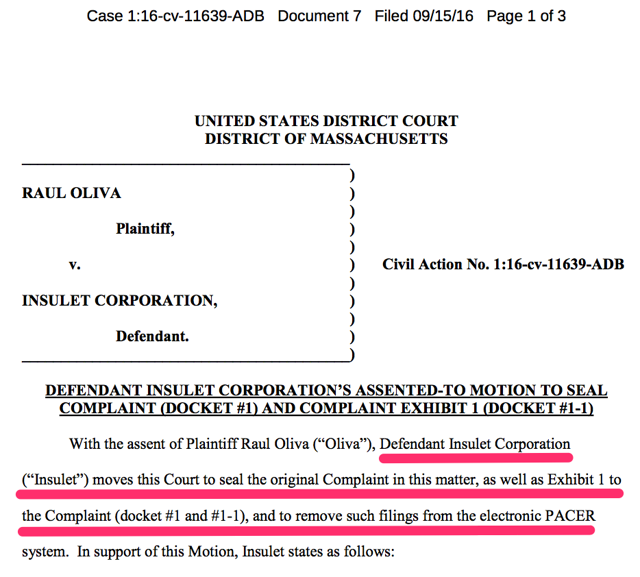 On September 15, 2016 PODD successfully obtained approval from the court to seal certain documents and content included within the original complaint filed by the plaintiff, Raul Oliva. It appears as though PODD and Mr. Oliva settled this legal action. Otherwise Mr. Oliva would not have consented to any portion of the court documents associated with the Oliva Complaint being sealed. See Exhibit 7. A January 14, 2015 JP Morgan analyst note explained the deception of PODD investors that Mr. Sullivan allowed to continue. "To begin with, Mr. Sullivan disclosed that US new patient starts were down 9% in 2014 vs. the approaching +20% that prior management was committed to and confident in as recently as the 3Q call [November 5, 2014]"
Mr. Sullivan became CEO on September 16, 2014. PODD confirmed the +20% growth rate on the Q3 2014 earnings call and Sullivan did not back track on this claim until he spoke at an investor event on January 14, 2015. It is clear that the deception of investors that originated with the prior CEO also continued from the day Mr. Sullivan was hired, September 16, 2014, until January 14, 2015 - a period of almost 4 months. However, as evidenced in the previous section regarding illegal acts, we believe the deception of investors continues to this day. "Management disclosures have been incomplete, at best…the ways in which the company discussed revenue targets, patient starts, and crucially, the components of guidance shifted over the course of 2014, misleading investors as to the underlying health of the core Omnipod business." A January 27, 2015 JP Morgan analyst note was issued even two weeks after Mr. Sullivan first disclosed significant issues at PODD. The analyst was still asking basic questions that had Mr. Sullivan had not fully answered. "…there is still no shortage of questions that matter to the 2015-2016 outlook, including (1) the damage caused by Insulet's botched second-generation [Eros] launch; (2) the impact of new and increased competition…"
A February 26, 2015 William Blair & Co analyst note describes Mr. Sullivan's actions bluntly - "piecemeal nature of recent disclosures." "After learning last month that new patient adds were well below what we have believed, with fourth quarter disclosures we learned that a fair amount of patients do not use Omnipod consistently…as discussed above, we are discouraged by the piecemeal nature of the recent disclosures…"
We noted that Daniel Levangie, who has been associated with Mr. Sullivan for some time now, announced his resignation as a PODD executive during the Q3 2016 earnings call on November 3, 2016 after 5 years with PODD. We also noted Mr. Levangie was referenced in the Oliva Complaint. Did Mr. Levangie resign in connection with the Oliva Complaint - which was settled just two months ago? PODD has had three Chief Financial Officers since Mr. Sullivan took over as PODD CEO. First, on November 5, 2014, Brian Roberts resigned as CFO. On March 30, 2015, just 5 months later, Alison Dorval resigned as CFO. Michael Levitz, who has famously claimed that quality control at PODD is improving even though FDA complaints are up, became PODD's CFO when Ms. Dorval resigned. Whenever a public company's top executive positions are consistently exhibiting turnover an investor has to wonder what the real reason for the turnover is. We believe the turnover is tied to Mr. Sullivan. We expect to research this further in the coming months. We summarize our current views with the following questions. 1. After considering the content of this report, why should PODD management be trusted? 2. If PODD management cannot be trusted then shouldn't investors reconsider the most important issue at play here - the Omnipod facing a substantial near-term competitive threat from the 670G and other innovative products on the way? 3. Omnipod faces a real risk of becoming an obsolete product in the near-term and may already be obsolete. Is there any realistic upside in PODD shares from here and is that upside comparable in any possible outcome to the obvious enormous downside risk? 4. If PODD truly is suffering now, like all of its competitors we identified in this report and DXCM, as a result of the approval of the 670G and expected approval of other next-gen products then why should PODD's shares remain at this level when its direct competitor, TNDM, is down sharply from its October 2016 highs? 5. Did PODD employees ever execute the bribes or other illegal acts Mr. Sullivan allegedly demanded of them? 6. Are any illegal schemes involving bribes of physicians or patients currently in place at PODD? 7. This action filed by Mr. Oliva appears to have been settled within a month of being filed. What were the terms of the settlement? 8. Why did PODD believe any content associated with this case needed to be sealed? 9. Has PODD's Board of Directors previously been fully informed of the Oliva allegations and has Mr. Sullivan been found to have committed any wrongdoing by the Board? Note - we informed the Board today just in case they were not aware of the allegations. 10. Did Daniel Levangie, apparently a long-time business partner of Mr. Sullivan's decide to part ways with Mr. Sullivan as a result of being named in the allegations made by Mr. Oliva? 11. In light of the allegations made by Mr. Oliva, is an investigation by the U.S. Department of Justice or the Massachusetts Attorney General in process? WE BASE OUR ANALYSES HEREIN ON OUR OWN RESEARCH AND PUBLICALLY AVAILABLE DOCUMENTS. WE ARE NOT GIVING YOU INVESTMENT ADVICE. IF YOU CHOOSE TO MAKE AN INVESTMENT IN PODD OR ANY OTHER COMPANY, YOU DO SO AT YOUR OWN RISK. IF YOU INVEST YOUR MONEY YOU MAY LOSE ALL OF IT. NOBODY HAS A CRYSTAL BALL, AND NEITHER DO WE. INVEST AT YOUR OWN RISK. We are short shares of PODD and are long PODD puts. We may add to our short position at any time. All information included within this report is sourced from publicly available materials. As of the publication of this report we have not communicated with the executive management of PODD or their shareholders.